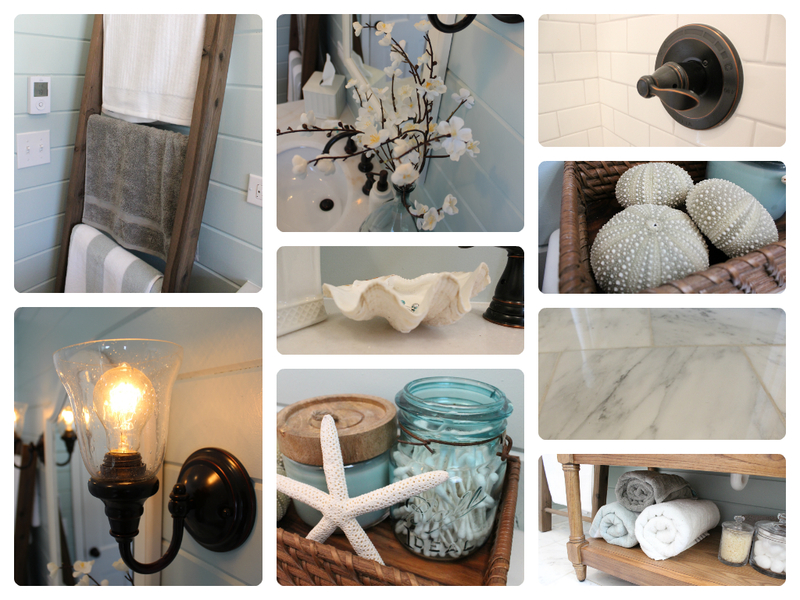 Our new guest bathroom is finally complete! Its been a labor of love and we did every single thing in this room ourselves except for the electrical rldrk, so we are especially proud. Before we show all the after pictures, let’s reminiscence about how it looked when we moved in. We demo’d it completely soon after and started from a clean slate. 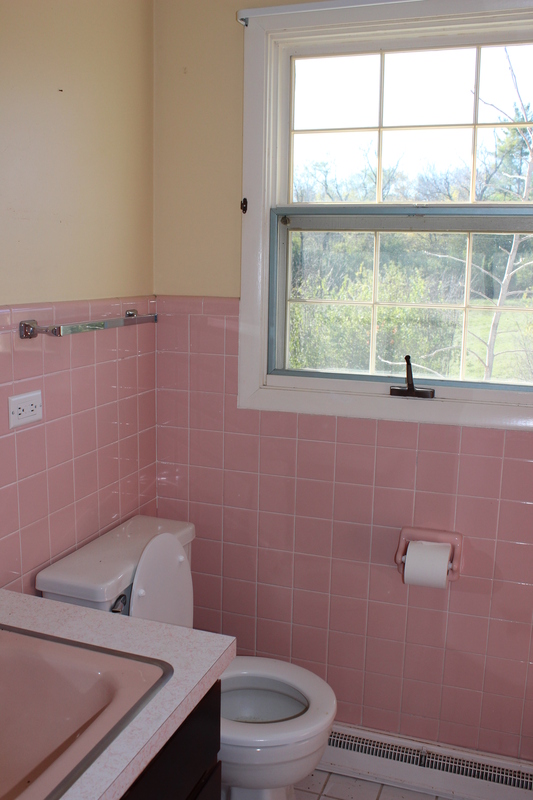 And now here is our brand new guest bathroom! 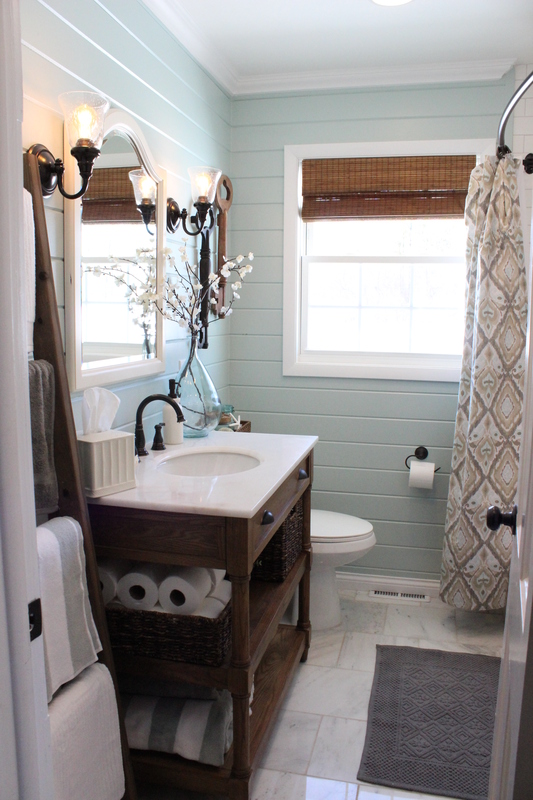 Since the last bathroom update, we added our DIY towel ladder (step-by-step here) and decorated the vanity with baskets, towels, etc. We also added pulls to the top to look like a drawer. 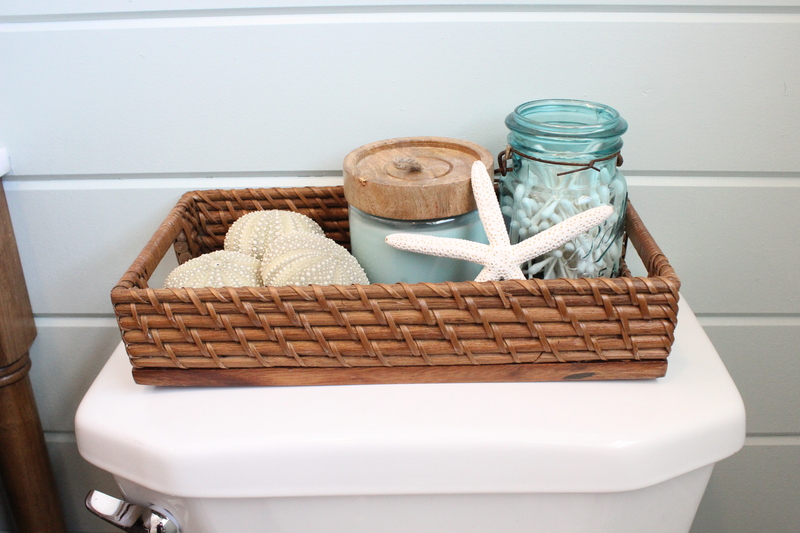 We hung a couple large wooden keys above the toilet and added a little tray over the toilet which holds a blue Ball jar full of cotton swabs, a candle and some shells. We brought in a little bit of Ben’s homeland with the kina shells from New Zealand. 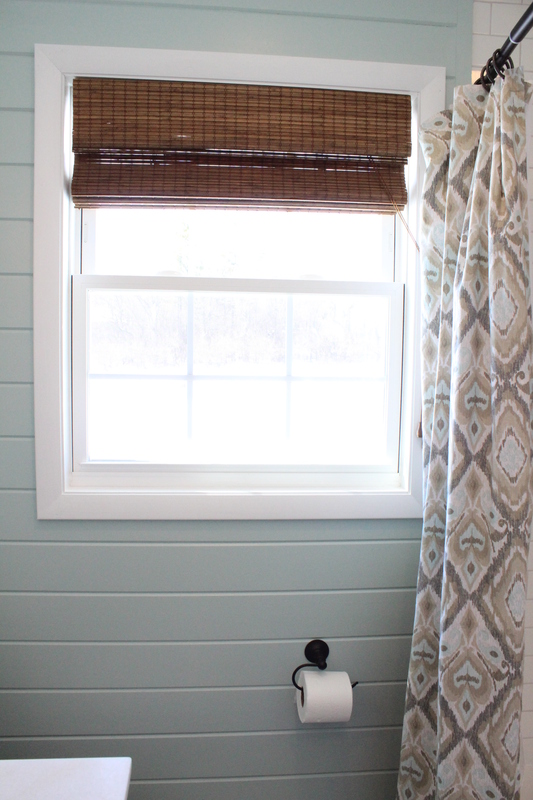 Ben installed a beautiful new window and we hung an inside mount bamboo shade from Home Depot. Just for fun, I put together this little collage of all of the little details of the room. 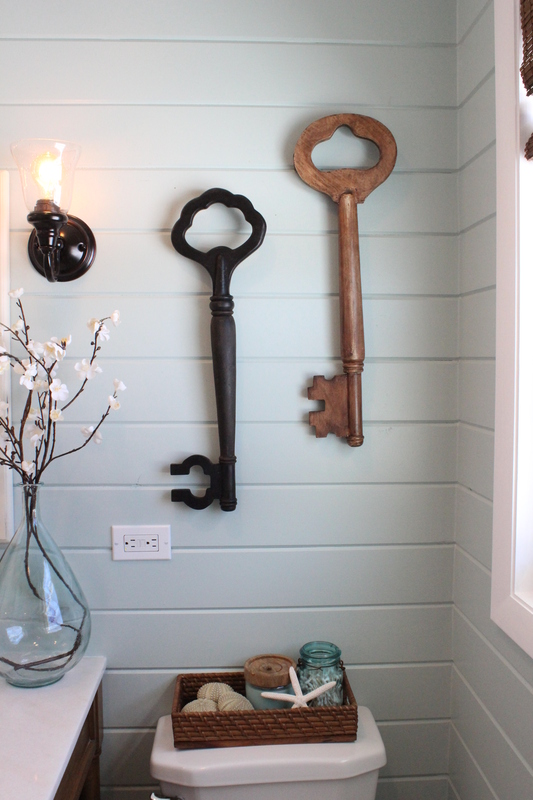 We’re so happy with the way everything turned out, and are even happier to call the first space at 12 Oaks D-O-N-E! 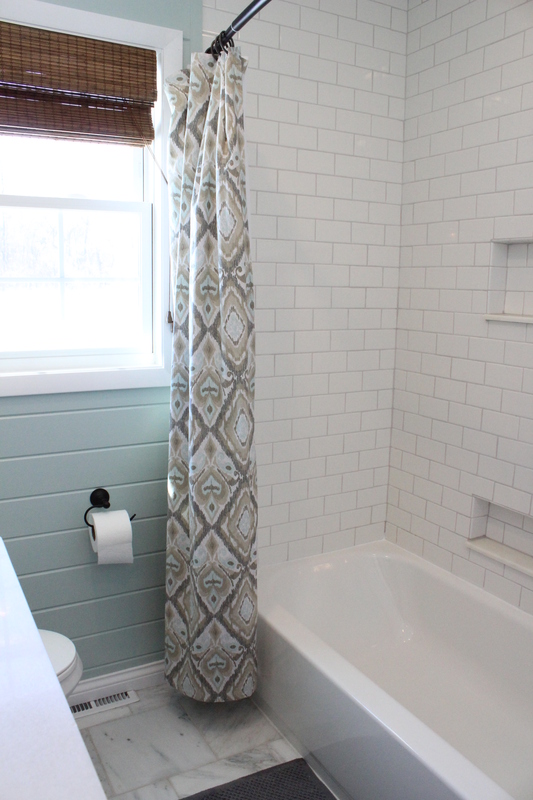 If you want to see how we got to the big bathroom reveal, check out Part I (drywall, tile backer, lights), Part II (tile, grout, wood wall planks) and Part III (vanity, trim, sconces, fixtures). Finally, I wanted to share a big ole source list, including paint and grout colors, for anyone who is wondering where to get anything. Wall paint: Benjamin Moore’s Palladian Blue; floor tile: white marble from Home Depot, tub/shower tile: white subway tile from Home Depot, vanity (including marble top): Home Depot/Decorators (also available on Amazon here); faucet: Delta from plumbingdepot.com; shower curtain: Kohls; light fixtures and “hidden” fan: Home Depot; towel ladder: DIYed for $16 (here’s how); toilet: Glacier Bay from Home Depot; mirror: Home Decorators; floor mat: World Market; bamboo blinds: Home Depot; bathtub/shower fixtures: Delta from Home Depot; grout: Mapei’s Frost color; baskets and over toilet tray: World Market; faux flowers: World Market; soap pump: Target; Ball jar: Antique find from Lake Geneva, WI; flower vase: TJ Maxx (similar one from World Market); tissue holder: Home Goods; clam shell: Fiji from our honeymoon; starfish: Michaels; wooden keys: Grandinroad; sconces (including vintage light bulbs and glass shades): Lowe’s; striped towels: Pottery Barn; white and gray towels: Target; glass canister set: Crate & Barrel; white pot and faux plant: Ikea; toilet paper holder: Moen from Plumbing Depot; kina shells: New Zealand; window: Studio 41; curved shower rod: Home Depot. I think that covers about everything. Now on to the next million projects which include the last spare bedroom which was being used as a work zone for the bathroom, new windows, taking out the main wall in the living room and an addition. Yup, big plans. 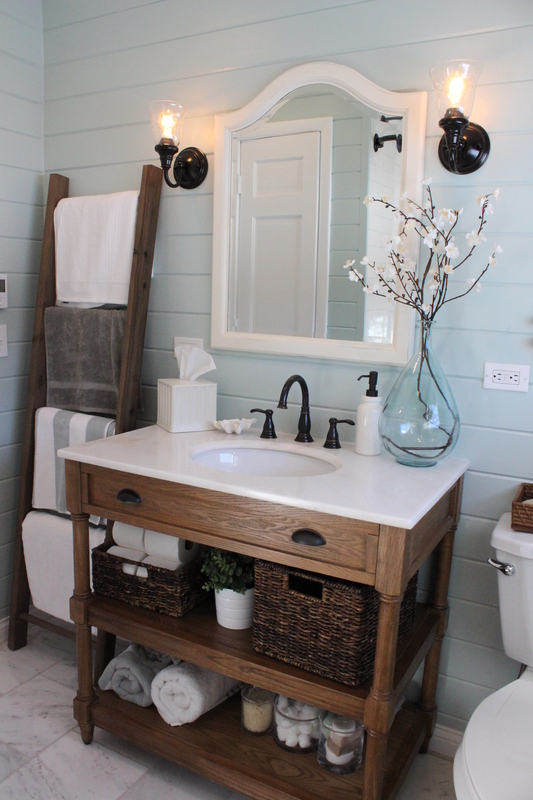 Beautiful Bathroom. 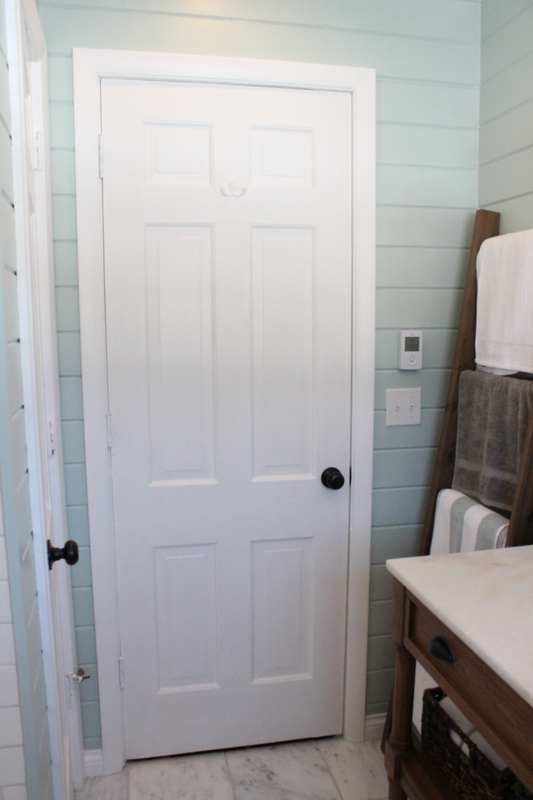 I like that DIY towel ladder. Beautiful! Can you tell me he name of mirror or where you got it? I have been looking on Home Depot website but I’m not having any luck finding it! This is gorgeous! Everything works so well together! 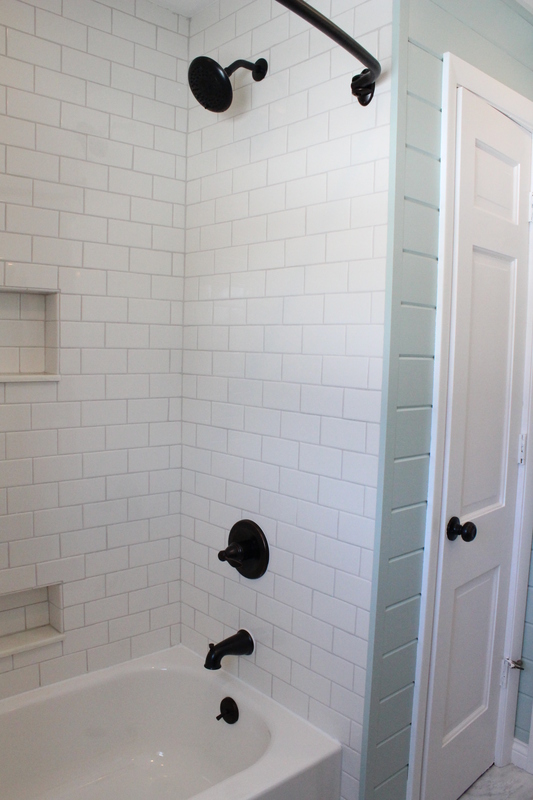 I struggle most with planning my budget, but this article helped me out a bit, thought I would share: https://mykukun.com/cost-guide/bathroom-remodel-cost/ it is quite a good read. Where did you get the vanity. I did not see it in your source list. TIA.